Celebrating the life of Rebert E. Johnson, IV. Be the first to share your favorite memory, photo or story of Rebert. This memorial page is dedicated for family, friends and future generations to celebrate the life of their loved one. Obituary for Rebert E. Johnson, IV. 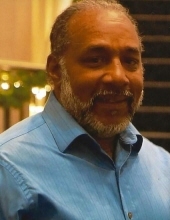 Rebert E. Johnson, IV., 64, of Brockton, passed away Sunday, March 31, 2019 at the Signature Healthcare Brockton Hospital. He was the husband of Theresa L. (Scott) Johnson. Born May 8, 1954 in Brockton, he was the son of Anne B. (Gibbs) Johnson and the late Rebert E. Johnson, III. Raised in Bridgewater, he graduated from Bridgewater-Raynham High School and the received an Associates Degree from Massasoit Community College in Drafting Technology. Rebert had worked as a Maintenance Supervisor at Cuming Microwave in Avon for several years and enjoyed woodworking, jazz, hiking and fishing. He is survived by his loving wife, Theresa L. (Scott) Johnson; his siblings, Dr. Judith A. Johnson, M.D., Michael A. Johnson, Kenneth L. Johnson, Paul D. Johnson, Phillip W. Johnson, Valerie M. Johnson and David A. Johnson; his step-daughter, Rona L. Dunn; his step-grandchildren, Nicholas Diles, Richard Dunn and Garison Dunn; he is also survived by 2 great-grandchildren and many nieces and nephews. Calling hours in the Russell & Pica Funeral Home, 165 Belmont St., (Rt123) Brockton on Friday from 4-7PM. Calling hours will continue in the Light House of Faith in Christ Church, 65 West Elm St., Brockton on Saturday starting at 9:00AM followed by a funeral service at 10:00AM. Interment will follow in Melrose Cemetery, Brockton. "Email Address" would like to share the life celebration of Rebert E. Johnson, IV.. Click on the "link" to go to share a favorite memory or leave a condolence message for the family.